Western blot analysis of extracts from HeLa cells, mock transfected (-) or transfected with a construct expressing Myc-tagged full-length human ATF-2 protein (hATF-2-Myc; +) or a construct expressing Myc-tagged full-length human ATF-7 protein (hATF-7-Myc; +), using Phospho-ATF-2 (Thr71)/ATF-7 (Thr53) Antibody (upper), Myc-Tag (71D10) Rabbit mAb #2278 (middle), and β-Actin (D6A8) Rabbit mAb #8457 (lower). 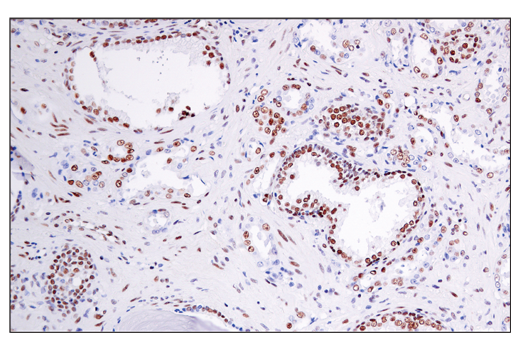 Immunohistochemical analysis of paraffin-embedded human renal cell carcinoma using Phospho-ATF-2 (Thr71)/ATF-7 (Thr53) Antibody. 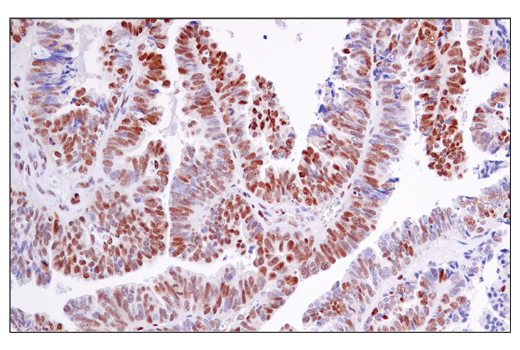 Immunohistochemical analysis of paraffin-embedded human serous papillary carcinoma of the ovary using Phospho-ATF-2 (Thr71)/ATF-7 (Thr53) Antibody. 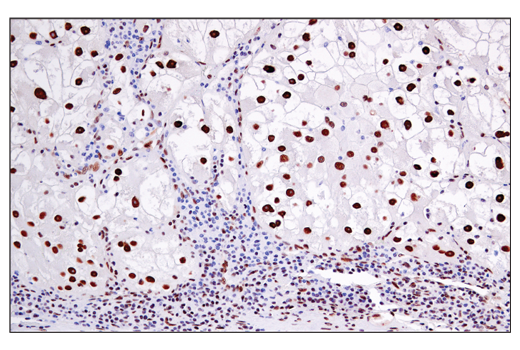 Immunohistochemical analysis of paraffin-embedded 3T3 cell pellet, untreated (left) or treated with Anisomycin #2222 (right), using Phospho-ATF-2 (Thr71)/ATF-7 (Thr53) Antibody. 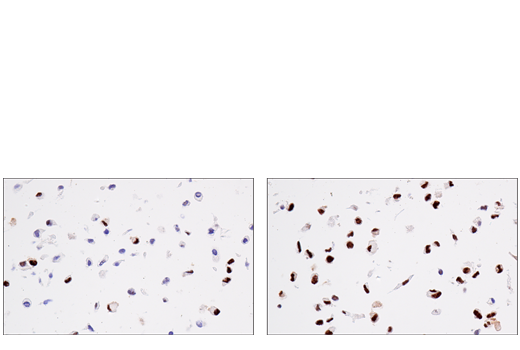 Immunohistochemical analysis of paraffin-embedded human prostate carcinoma using Phospho-ATF-2 (Thr71)/ATF-7 (Thr53) Antibody. 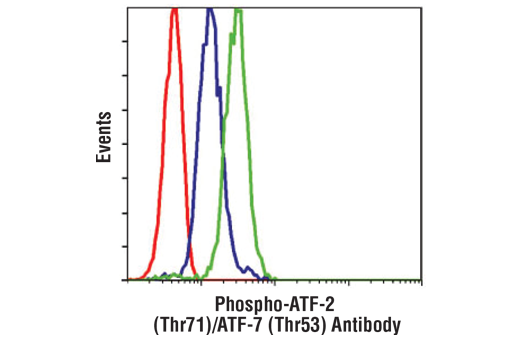 Flow cytometric analysis of Jurkat cells, untreated (blue) or Anisomycin-treated (green), using Phospho-ATF-2 (Thr71)/ATF-7 (Thr53) Antibody compared to a nonspecific negative control antibody (red). 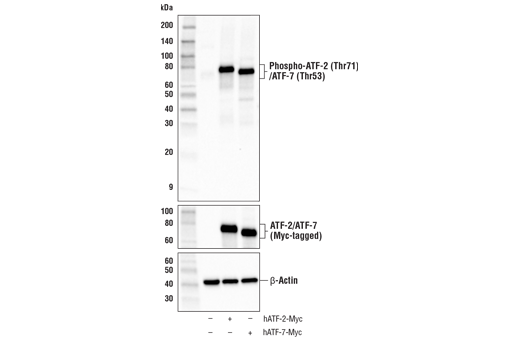 Phospho-ATF-2 (Thr71)/ATF-7 (Thr53) Antibody detects endogenous levels of ATF-2 and ATF-7 only when phosphorylated at threonine 71 and threonine 53, respectively. 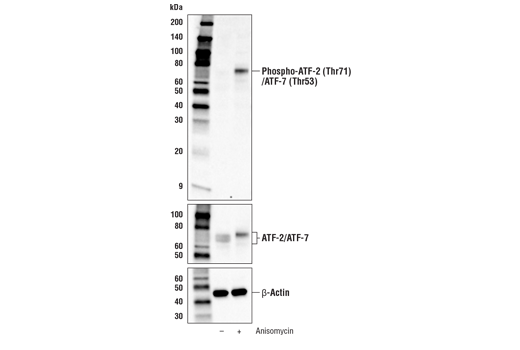 This antibody does not cross-react with phosphorylated c-Jun, CREB, or other transcription factors. It recognizes Thr69/Thr71 dually phosphorylated ATF-2, Thr51/Thr53 dually phosphorylated ATF-7, Thr71 singly phosphorylated ATF-2, and Thr53 singly phosphorylated ATF-7 equally well. Polyclonal antibodies are produced by immunizing animals with a synthetic phosphopeptide corresponding to residues surrounding Thr71 of human ATF-2. Antibodies are purified by protein A and peptide affinity chromatography.